Templates give quilters an exact pattern to work with, whether it is curves, angles, one-patch shapes or appliqué designs. Templates will give your quilt a sharp finish by providing quilt blocks and patchwork pieces the correct angles to fit together perfectly! It is always a good idea to cut your quilting templates with a rotary cutter, however if you are using a rotary cutter to cut your fabric it is advised to use a different one to cut acrylic or even cardboard is it may blunt the rotary cutter’s blade. The edges of cardboard and paper will tend to wear out after a few uses so it is often best to invest in some acrylic plastic templates as they will last a lot longer. Both plastic and metal templates are virtually indestructible for quilting use. 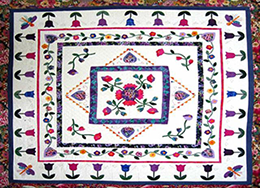 If you are making a large quilt it is recommended to use an acrylic or metal material as it will be easier and more accurate than cutting out many small pieces of cardboard or paper. Accuracy is essential for perfect pieced patchwork and appliqué. It is vital that your patterns are exact, which effectively means your templates need to be cut perfectly and geometrically accurately. Templates are quilt maker’s working patterns. You can reference the original patterns on paper and store them be reused later or lent to a good friend or quilting buddy for them to use. Window templates and stencils are also fantastic if you are using a central motif such as a flower and need a little guidance. If you are hand sewing or using appliqué, make sure your templates are cut to the exact shape without using a seam allowance therefore marking the stitching not cutting line. When machine sewing you can allow for a seam allowance of generally 5 cm or around 1/4 inch. Sturdy acrylic quilt templates will allow you to cut all your pattern pieces always the same size, every time, without measuring. With accurate and consistent results you’ll be creating that next heirloom-quality quilt in no time at all!